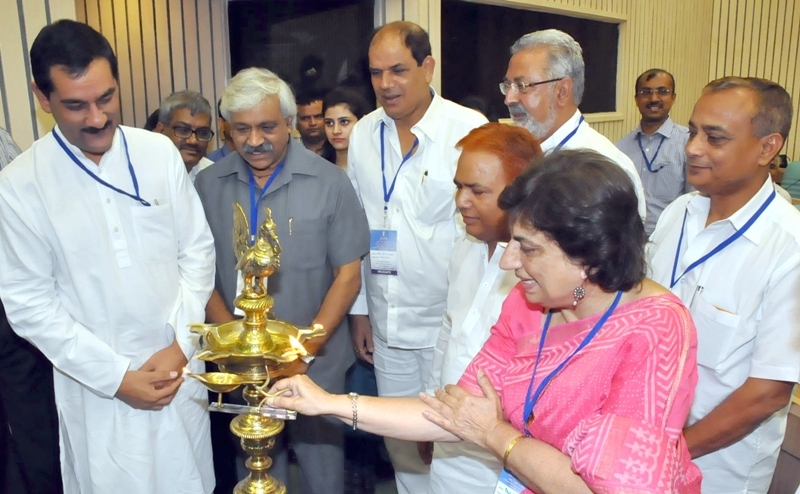 The Minister of Youth Affairs and Sports Shri Jitendra Singh has said that supporting and promoting the youth development must be one of the foremost priorities, across all sectors and stakeholders in the country. Inaugurating the conference of Ministers and Secretaries of States and Union Territories in-charge of Sports & Youth Affairs here today he said, Sports is one of the best ways for engaging the Youth of today as it builds character, promotes discipline and leads to healthier lifestyles. Sport has a unique power to attract, mobilize and inspire. The Minister said, all government departments must make a concerted effort to ensure youth mainstreaming across sectors and policy areas. Shri Jitendra Singh said, the Commonwealth Games 2010, the Asian Games 2011 and the London Olympics in 2012 were all milestones in our sporting history. We won our highest ever medal tally in each of these competitions, with the six medals in the London Olympics being the highlight. But six medals for a nation of one billion people is not really a satisfying result. The minister said his vision is by 2020 India will be among the first ten sporting nations in the world and by 2024, among the first five. The Minister said, he dreams of an India in which Sports is a way of life, where Sports will be a lucrative career option. He said, Department of Youth Affairs has taken a new initiative for skill development among youth. It has taken steps to reposition NSS as National Service and Skill Development Scheme (NSSDS) with a view to enable students to gain employable schemes while undertaking community work that brings about social change. Spelling out his long term plans to change the face of sports in India, the Minister said, a series of proposals will be unveiled soon linked to Youth Affairs and Sports. He said, his Ministry is working towards revamping Panchayat Yuva Krida AurKhel Abhiyan (PYKKA) and in the revised PYKKA; the big difference will be at the block level. The central government will give States the funds to create a full sports complex. There will be football grounds, athletic tracks, courts for volleyball, basketball, badminton, kho-kho, kabaddi etc. He said, each complex will have an indoor hall for contact sports and some other popular sports of the region. Each such Complex will cost Rs. 1.75 Crores. The funds will come out of PYKKA, the Backward Region Grant Fund (BRGF), the Non-Lapsable Central Pool of Resources (NLCPR), the Integrated Area Plan (IAP) and MG-NREGA. The Minister said, close to 6500 such complexes will be built across the country. It’s a massive effort that will cost 11,000 Crores. The Minister said, Union government is also working on a scheme calledIdentification & Nurturing Sports Talent (INSTAL). In the proposed scheme, in each district, a special school meant for young people who have shown talent in sports is proposed to be set up. He said, 100 talented young boys and girls in the age group of 6-10 years selected through the PYKKA competitions will be offered admission to the District Sports Schools. All their boarding, lodging, special diet, sports kit, school fees and other expenses will be met through a stipend. He said, each of the children who are admitted to the schools will be guaranteed a job under the sports quota of the Central Government or the State Government. Shri Jitendra Singh said, Sports Authority of India (SAI) will set up 25 centres of excellence or COX across the country. Each COX will specialise in 3 to 4 sports disciplines. He said, the government of India will set up two centres of excellence. One will be for sports medicine and the second for sports coaching. He said, a new programme of sports scholarships under which up to 10 scholarships will be offered every year will be announced soon. Under the programme, the scholars can go to any reputed institute in the world and all their education and living expenses will be borne by Government of India. Referring the good governance in the sports bodies, the Minister said, there is need for bringing in transparency in the functioning and promoting good governance amongst the sports bodies at state level and district level. Therefore, the state governments need to issue such instructions immediately. He said, 53 out of 54 National Sports Federations (NSFs) have agreed in writing to amend their constitution to incorporate the provisions of Sports Code. He said, a Working Group has also been constituted under the chairmanship of Justice (Retd) Mukul Mudgal for re-drafting of the National Sports Development Bill 2013. Besides the Ministers and Secretary in charge of Youth Affairs and Sports, several other prominent persons from the field of sports and youth are attending the two-day conference. Young Parliamentarians, members of Sports Federations, Vice Chancellors of prominent Universities, Central Government Officers andrepresentatives from reputed Corporates and Business Houses are also participating. The conference provides a platform to the Central Government and the States/UTs to not only understand each other’s point of view and discuss ways to improve all facets of the Schemes being run for development of Youth and Sports but also share success stories and best practices for inclusive growth. The following agenda points will be discussed in the conference.